While February can be a dark and cold month for many people, the amethyst is perfect for offering a bit of warmth to any wardrobe during this frigid season. Once known as the jewelry of royalty and featured in crown jewels, it is a blend of violet and red with an attractive luster. The name amethyst comes from the Ancient Greek word “methustos” meaning intoxicated. The ancient wearers believed it could protect them from drunkenness. It was also said that it would keep those who wore it clear-headed and quick-witted. Qualities like peace, stability, courage and strength are believed to be derived from this gemstone. These qualities led amethyst to be regarded as a precious stone and for years was even held in the same class as a diamond. Once it was realized how abundant amethyst was, it was enjoyed by many – not just the wealthy. Amethyst is composed of quartz, which is the second most abundant material in the earth’s crust and can be found in nearly every corner of the globe. One of the great things about an amethyst is that the price difference in carat sizes is not significant, making this the perfect gemstone for a larger statement piece. Consider large earrings, a bold ring or a pendant for a nice addition to any jewelry wardrobe. 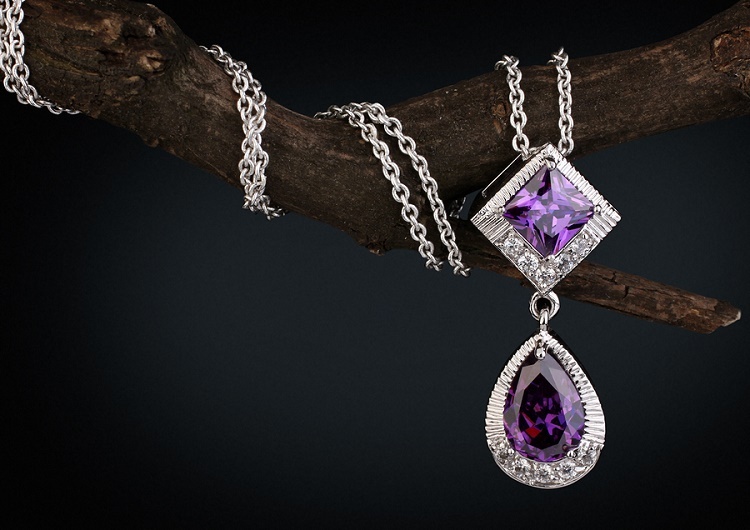 Treat your significant other to a beautiful amethyst piece this February. It can also be the perfect present to celebrate the 6th and 17th wedding anniversaries. Once a jewelry collection is started, contact Lavalier for a personalized insurance quote and protect the items that signify so many special occasions. Birthstone Jewelry. www.brilliantearth.com. (accessed Jan 18 2019). February Birthstone. www.americangemsociety.org. (accessed Jan 18 2019).